What Killed the Talking Filibuster? Kris Wood is an HNN intern and a student at New York University. How 'bout it, Senator Payne? Where'd it go? On August 29, 1957, Senator Strom Thurmond sat in a steam bath, preparing himself for what he knew would be a long evening. Normally an undertaking reserved for post-physical activity, Senator Thurmond’s time in the sweat box was in preparation for an oratory workout that would come later in the evening. While most people make use of steam baths for relaxation, Thurmond had other plans in mind. The senator intended to flush any excess liquids out of his body, forestalling the need to use the washroom, for what would end up being the longest solo filibuster in the history of the U.S. Senate, a filibuster that lasted for 24 hours and 18 minutes. While Senator Thurmond’s tour de force was no doubt an impressive display of marathon public speaking (although appreciation of the senator’s endurance must be coupled with the fact that Thurmond’s speech was a ploy to delay voting on the Civil Rights Act of 1957, a bill which aimed to protect the voting rights of African Americans), today is almost unheard of for a filibuster of this kind to occur. 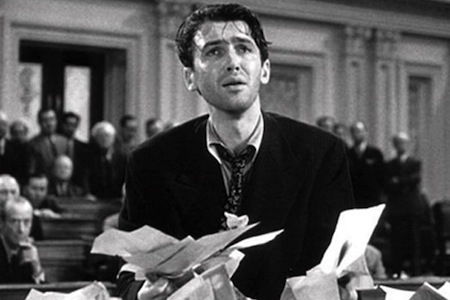 Rare are the Jimmy Stewart-style rants made famous in Frank Capra’s 1939 film, Mr. Smith Goes to Washington. So what killed the talking filibuster? This question requires a bit of historical context to fully explain. The first use of the filibuster in sessions of the United States Senate occurred on March 5, 1841, when several members of the senate, objecting to the firing of Senate printers, spoke at length to delay legislation. The filibuster lasted until March 11 of that year.. In 1917, the Senate adopted the “cloture” rule which stated that a debate could be ended with a two-thirds majority vote from the Senate. However, the cloture rule was rarely invoked, as the two-thirds majority proved hard to come by. Between 1927 and 1962 there were eleven instances when the Senate sought to invoke cloture. None succeeded. During this period filibusters were often defeated by negotiation or waiting out the filibustering Senator, hoping they would simply run out of steam. This all changed by the end of the 1960s as frustrations over the repeated attempts to filibuster the Civil Rights Acts of 1960 and 1964 led many senators to embrace the act of voting for cloture. There was an added dimension to this frustration: a filibuster prevented other legislation from being debated. By 1971, West Virginia senator Robert Byrd -- then Senate majority whip -- had had enough, and proposed new rules which allowed for other bills to be considered during a filibuster. Partly thanks to the new rules, the number of filibusters subsequently spiked up to thirty-one in the 1973-74 session. Even so, this process does not come down to the matter of a simple vote. To invoke cloture, along with the essential sixty votes, Senate rules require"
Since 1975, the act of filibustering has evolved into an action that is carried out far from the Senate floor. Senators who wish to stall a bill now often choose to use the informal procedure of enacting a “hold” on a bill, which allows for a senator to simply inform their party leader that they wish to halt a bills consideration, while remaining anonymous in most cases, ending debates before they even begin. At this point, either the senator’s issues with the bill -- or appointment -- are dealt with ahead of time or the hold goes to the floor for a cloture vote. If the vote to cloture fails, then the bill rarely is brought up again for debate. In the 1900 to the 1970s, there was an average of one silent filibuster per year, one. Just one. And under the rules, this type of objection consumes a week because once the objection is made to unanimous consent to hold a majority vote, then a petition must be filed. A petition by the majority that wants to proceed. So they go and get sixteen signatures. That takes a little bit of time. And then once that petition has been filed -- that's called a motion, a motion -- a cloture motion to close debate, then it takes two days to get to a vote. The vote has to happen the day after an intervening day. So two days are gone. And then if sixty members say yes, we want to close debate, then you have to have thirty hours of debate time before you can actually get to a final vote. So the whole week is taken up by that process. Well, in the 1970s, the average grew to sixteen per year. Well, that's sixteen weeks wasted per year. The 1980s grew to twenty-one per year average. Now we're getting to well over a third of the number of weeks in the course of the Senate year. Then we go to the 1990s. We're up to thirty-six, thirty-six such silent filibusters taking up thirty-six weeks. We get to the decade 2000-2009 and an average of forty-eight or almost one per week. Starting to squeeze out any ability to address the big issues facing America. And then since I came here in 2009, we have an average of over sixty, over sixty per year. More than one per week. And as a result this last two years was the most dysfunctional legislature in decades. Big issues facing America, this floor, this forum of deliberation paralyzed by the continuous use of the silent filibuster on every issue. Essentially, what this silent filibuster has done is convert this to a supermajority body, and not only that convert it to a body that spends its entire year just trying to get to the vote as to whether we can have a final vote. That's the level of dysfunction that we have reached. Occasionally, a talking filibuster of the old style will still be held on the floor. As recently as 2010, Vermont Senator Bernie Sanders’s filibuster opposing a Democratic tax cut deal with Republicans became a viral hit on the Internet (though it's doubtful many viewers made it through the whole thing; a full transcript can be found on Senator Sanders's website). Filibuster reform has recently become a priority for the Democratic Party, frustrated by Republican stalling tactics that have made votes on even the smallest legislation a laborious event. Regardless, there is little debate about one thing: the Senate has become a dysfunctional mess. It may be time to assess whether the filibuster has become an anachronism. Even, if only, to prevent future senators from having to listen to one of their fellow members of Congress recite Hamlet for twenty-four hours straight.